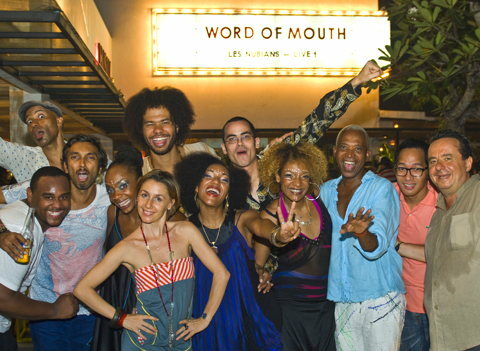 When in Bali, please take my advice and listen to word of mouth — meaning Word of Mouth Bali, of course, the showroom-playroom of Valentina Audrito (below, out in front) and Abhishekar Khumbat (below, third from left), on Jalan Kunti in Seminyak. Val and Abhi always colour outside the lines and stubbornly remain impossible to define. So who was surprised when they brought a French-Cameroonian Grammy-nominated act, Les Nubians to the stage right here in Bali, right here in their wacky playspace? Not me. I expect the unexpected from Word of Mouth, and that’s usually what I get. 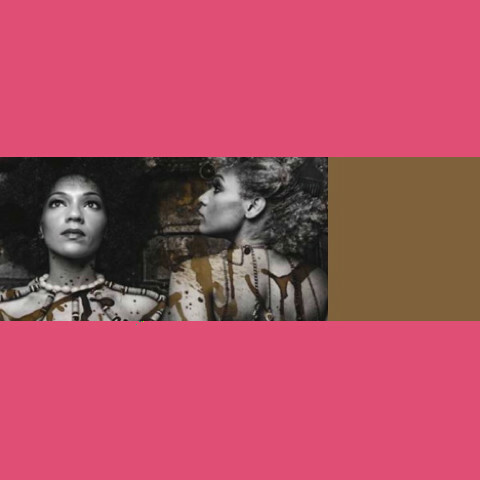 Les Nubians came to us fresh from a run of Jakarta gigs, bringing a full nine-piece band to back them. And just like Word of Mouth, their sound is impossible to define. Call it a glamourous Afropean cocktail, shaking up memories of Miriam Makeba, Ella Fitzgerald, Doudou N’Diaye, and Fela Kuti, the lot topped with a double shot of pure funk – – plus, up front, Hélène and Célia Faussart (above) deliver vocal harmonies that conjure up ghosts of old gospel, and blues baladeers. Indescribable. As was the atmosphere at Word of Mouth on the night (below). The crowd was mixed in terms of size, shape, colour, vintage, style, and origin, but unified by creative spirit – – and fast-flowing spirits from the Word of Mouth bar. We picked some pals out of the party mix, like eboniste extraordinaire Etienne de Souza (above, third from right), metteur en fête Eric Van Bruggen, and fashion talent rep Gaby Wehn surrounded by a cloud of wispy models. And wonder-of-wonders, ensconced in the back banquette were Abhi’s parents, Mr. and Mrs. Shyam Kumbhat. Papa Kumbhat was in town a couple of weeks already, had been seen at a few parties, and apparently adopted “The Legian Look.” He was sporting a loud beach shirt shirt and a BALI baseball hat, while Abhi’s mother was more conservative in her ivory and gold silk sari. Although Abhi seemed bemused by his dad’s new Baba Cool persona, he was ecstatic to see his mother actually tap a toe and twitch a shoulder microscopically to the beat. Les Nubians could make a statue dance. And they blew the roof off Word of Mouth. Beautiful night. Beautiful crowd. Beautiful show. With three beautiful singers in slinky innnovative Word of Mouth dresses wearing modern-ancient bijoux by Monica Benet. Very hot. This event was hot in every possible way, with no shortage of tropical sweat. We noticed the ceiling fans were off, and wondered why. Abhi explained that the height of the temporary stage made it impossible to have big afros and ceiling fans going on at the same time. Of course. Not to be mean, but the sound system was somehow incompatible with the acoustics of the space, and cranking the volume certainly didn’t help. One more “action item” for WoM chef d’affaires Fabrice de Barsay: maybe it’s time to invest in a “broom”. As the evening went on things started looking a bit “dirty”. Oh well. Teething pains. WoM will surely get it right next time.